I get home from an especially full on day. I’m feeling tired and a bit stressed out. I have one of those tension headaches lurking around, making me frown and fueling some serious grumps. I pull out my phone, open Alto’s Odyssey and feel it all melt away…. It sounds annoyingly dramatic, but is actually true! 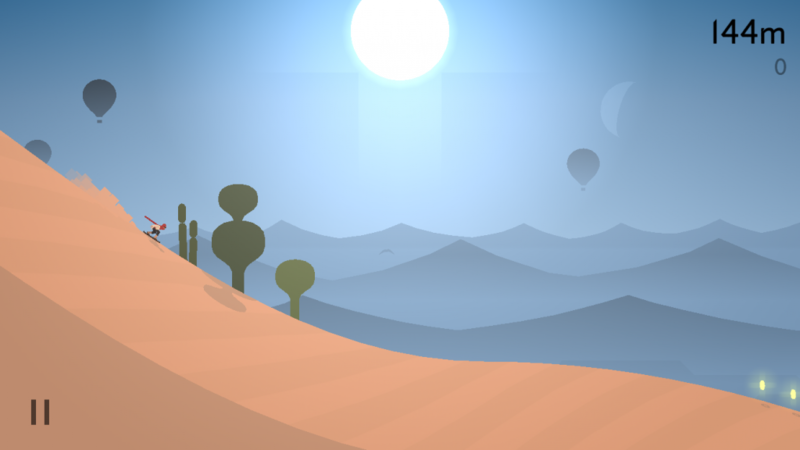 Alto’s Odyssey is the perfect blend of visual beauty, soothing sounds and challenging (but not frustratingly so) game-play, to chill you out or simply pass a bit of time. I’ve only played a tiny bit of Odyssey’s predecessor, Alto’s Adventure, so I can’t do an in-depth comparison of the two games myself, but you can check out Jaz’s review of it here! From my limited knowledge of Adventure, Odyssey really kicks things up a notch! Alto’s obviously had enough of the cold, as Odyssey moves far away from the snowy slopes of Adventure and into the sandy desert! You can now explore three stunning biomes, each with their own challenges and unique takes on familiar game mechanics. 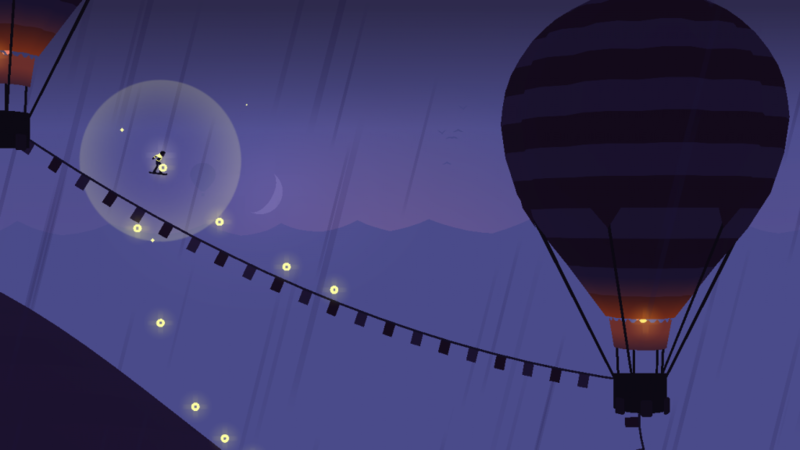 Grind on bunting between hot air balloons, breakable vines and speed down rapids! Use tornadoes to give you an epic trick boost, perfect wall grinds to climb to greater heights and bounce across hot air balloons as you rake in those points. Out with the Alpacas and in with the Birds of Paradise! 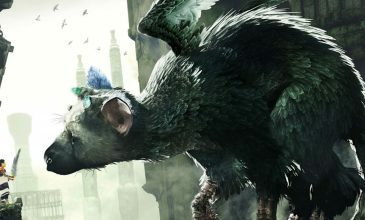 You collect these beautiful creatures as you get further in the game. I get a genuine rush of excitement every time one joins me and begins swooping around my character. There was a sense of purpose that chasing and collecting those Alpacas gave you that Odyssey is unfortunately missing. 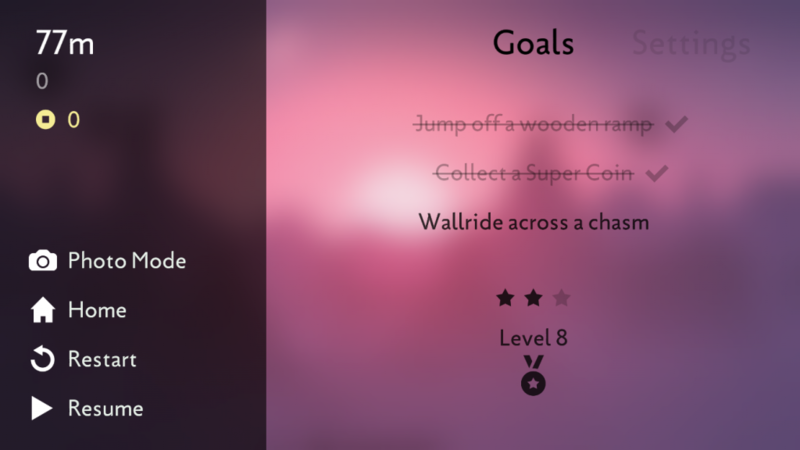 The birds don’t really feel like any kind of achievement. More of a magical moment between you and the wild. The ‘Elder’ from Adventure has been replaced with a much cuter, though just as stressful, Lemur! Thankfully the Lemurs feel like they hang around for a shorter amount of time than the Elders did – but they are very quick and agile. You have to work hard to shake them! Nooooooo Leeeemuuurrrr! Oh hi Bird! You might have seen someone playing Adventure or Odyssey before and wondered what the on-going appeal is of a game that seems to just be the same thing over and over. You and me both my friend, you and me both. I’m happy to tell you that the game keeps you inspired with randomised maps each game, day and night cycles (which really change the difficulty! ), different weather and increasingly harder levels of challenges. You’ve always got goals to achieve and awesome rewards to unlock – which include new playable characters! 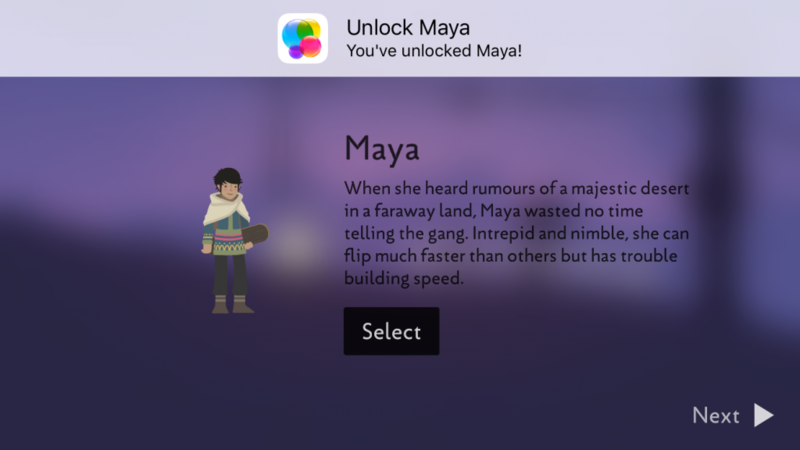 Maya is my current favourite character. She doesn’t quite get to the speeds of Alto as easily, but you can successfully land more impressive flip combos with greater ease – and that’s what it’s all about! My usual relationships with app games is a bit like a fleeting crush. I’m all about them for a couple of weeks to a couple of months, but I soon burn out from the intense time-demands most seem to have, lose interest and move onto the next one. Odyssey, however, with its relaxed nature (no time demands or need for in-app purchases), will become a long-term friend. 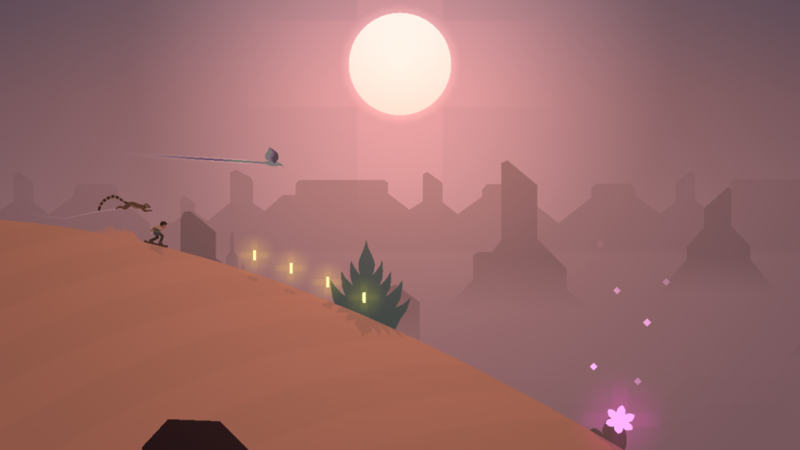 If you’re a fan of Alto’s Adventure, you may wish Odyssey had a little more to offer in the way of difference from the first. After awhile of playing it I also feel that being able to race against friends would be a good option to broaden the appeal. But at the end of the day, there’s no doubt about it – if your phone isn’t already home to Alto’s Odyssey, you need to rectify the situation right away. It’s hands down the best all-round app game I’ve experienced.